Our church is located in the bedroom community of Speegleville, a rural setting just outside Waco, Texas. We serve the Speegleville area as well as the greater Waco area. Our church was founded in 1850 and maintains a relevant ministry in our area. We are a Baptist church and have strong ties to the Baptist way of life. We are affiliated with the Waco Regional Baptist Association and the Baptist General Convention of Texas. We also cooperate with the Southern Baptist Convention through our contributions to mission endeavors. 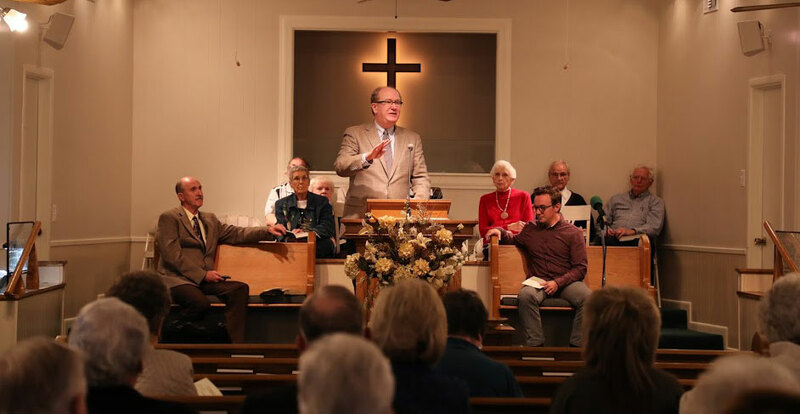 At Speegleville Baptist Church, we seek to grow in our walk with the Lord, in our relationships with others, and in our compassion through ministry and mission to Speegleville and the world. Our church invites you to come grow alongside us. Paul wrote in Romans 12 that “Just as each of us has one body and with many members, and these members do not all have the same function, so in Christ we who are many form one body, and each member belongs to all the others.” We are thankful God brought us together as a family of faith where we the build God’s kingdom for today and for the future. Our church consists of more than bricks, mortar and wood. The Church is made of the people who inhabit our buildings, participate in our activities and share in our ministry. Our prayer is that we grow together in service to God. Join us as we worship God - share Jesus - build the body of believers. Joe has served as pastor of Speegleville Baptist Church since the fall of 2002. He was born in Waco and graduated from Calvert High School (a powerhouse in 6-man football). He holds a B.B.A. from Baylor University, a master of divinity from Southwestern Baptist Theological Seminary in Fort Worth, and a doctor of ministry from Baylor’s George W. Truett Theological Seminary. Joe enjoys reading, sports, music, table tennis, Dr Pepper, Whataburger (though he claims to be eating a healthier diet), and playing the guitar. He loves the latest gadgets (especially Apple products), but most of all, he loves serving the Lord through Speegleville Baptist Church. Joe’s wife Angela is a native of Knoxville, Tennessee and holds degrees from the University of Tennessee, Knoxville, and Southwestern Baptist Theological Seminary. Angela works in the Garland School of Social Work at Baylor University and serves faithfully in many ways at our church. She enjoys cardmaking, cooking and McAlister’s sweet tea! Joe may be contacted at baileyspeegleville@sbcglobal.net. Jordan joined the Speegleville staff in the fall of 2017. He is a native of Tennessee and came to Texas to attend George W. Truett Theological Seminary in Waco. While a student at the University of Tennessee, he was an intern at the First Baptist Church of Knoxville and with a summer ministry program in Anchorage, Alaska. He met his wife Tori at the University and both graduated in spring 2017. They married after graduation and moved to Waco shortly thereafter. She teaches math at Waco High School. Jordan enjoys disc golf, soccer and most anything to do with sports. David Denning has been a member of Speegleville Baptist since 2002 and has served as music minister since 2010. He is a Sears Home Improvement representative. David and his wife Cindy have six children. Jo Ann has lived in Waco most of her life. She and her husband Russell have three children and three grandchildren. She attended Waco High School and McLennan Community College. Russell is a deacon serving Speegleville church. Together they enjoy reading and singing in the choir, along with their son Joel. She likes to sew and quilt. Shauna joined the church staff officially in December 2018. She and her husband Brannon have been members of Speegleville Baptist Church since 2013. Shauna grew up in the area graduating valedictorian of Crawford High School and then moving on to graduate with a Bachelor’s degree in Mathematics with a minor in English from Texas Woman’s University. Since Shauna can remember, she has wanted to be a teacher; therefore, she is also a certified teacher. After 15 years in the classroom, Shauna has taken a hiatus to stay at home and raise their boys but has never totally left the education world. Education is her career, hobby and passion. Shauna’s husband Brannon is part of the Office of Information Technology at Texas State Technical College. He enjoys all things “techy” as well as anything outdoors. Together they have two boys, Noah and Levi. © 2018 Speegleville Baptist Church. All Rights Reserved.